The core drivers of climate change cause other problems too. The good news is, for every problem there’s a group of people who would benefit from solving it. From the first exploratory survey for fossil fuels until the end of the century when today’s greenhouse gas emissions will still be influencing our planet, the fossil-fuel economy causes harm. Climate advocates have tended to focus on the distant end of that long chain of harm, and it’s easy to see why. Climate change brings such risk of irreversible harm that it can seem wise to treat it as a singular problem, worthy in its own right of single-minded focus. But, what if climate change were easier to solve if we saw it not as THE issue, but as one symptom of an underlying problem that also produces ill-health, injustice, and insecurity? Perhaps we could gather more political will to face all these challenges together than we’ve found to tackle them individually. For the last six months, researchers at CI and our partner organizations have been considering that proposition. After all, in our systems thinking trainings, one of our first pieces of advice to leaders is to take a step back in order to see a bigger picture. What we’ve learned has been fascinating and hope-producing. Around the world people are taking actions that lower carbon footprints while also solving other problems. Seeing climate change as part of a larger set of issues, a perspective which was first and best articulated by the environmental justice movement decades ago, is becoming more common as people around the world connect the dots between local immediate issues and long-term global ones. Of course, squeezing carbon out of our economy doesn’t necessarily mean we’ll improve health or open up opportunities for marginalized communities. To do that we’ll need to think beyond megatons and parts per million and also think about years of life saved, degrees of equity improved, and capacity for resilience built. We’ll need climate and energy experts to talk with public health experts and labor economists and we need all of them to listen to the dreams of ordinary citizens. It’s going to take systems thinking to see all the interconnections, and hard listening to fully grasp the diverse needs and interests of the many groups touched by climate change. Still the promise is huge. Seeing a bigger picture can give us a movement large enough to wield significant political power, and a vision of a future that includes not only lower levels of carbon in the atmosphere but also more fairness, better health, and true wellbeing in our communities. Toward those big goals, we’ll be sharing the results and implications of our research in upcoming posts, and we will be looking for your input about how to use what we’ve learned to make a big difference towards a better future. 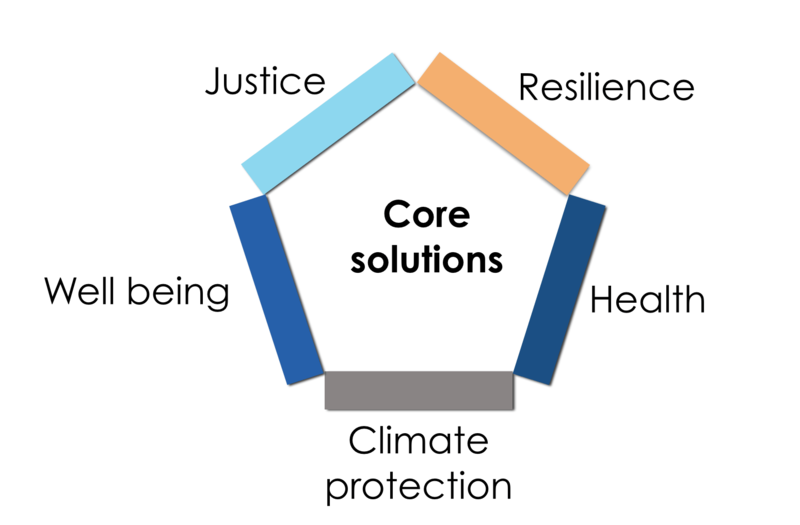 This post is part of a series on ​multisolving​, or climate-smart policies that simultaneously work to mitigate climate change while providing co-benefits such as the ones described above. Fantastic frame! If Climate Interactive can help develop a decision support tool that accelerates cross sector conversations, it will be a huge contribution toward triple and quadruple bottom line solutions. It will better enable people and diverse constituencies to see their part and their impact in relation to others – which is a big first step to crafting solutions that don’t have the bite of unintended consequences. Awareness is everything and system thinking tools go a long way toward helping us explore the “what if” questions – as well we arriving at “a-ha” moments that support inclusive and lasting solutions. Bravo on your early efforts. Looking forward to following your discoveries.